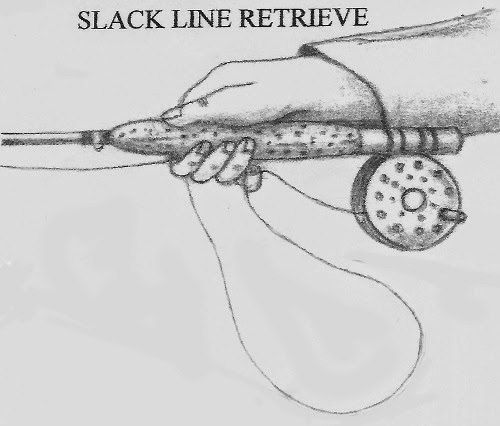 Slack line can be effectively used when mending the line and casting the fly. 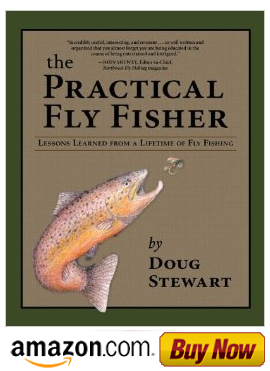 However, it can be a problem in casting and playing fish if you don’t learn how to control it. A good example is when a fish runs directly at you. Single action reels aren’t fast enough to retrieve the line, so it must be stripped quickly to keep up with the fish. This action may produce coils of line at your feet that can tangle; so what can you do? First, wait until the fish stops running and then, with your index finger holding the line, grasp the slack line with your little finger of your casting hand. The index finger becomes a second line guard. Then, with pressure still on the fish, begin to reel in the slack line. If the fish suddenly makes another run, drop the line from your finger and continue to play him from the reel. From here on, fast winds can usually get the slack line back on the reel in short order.